August 13, 2013 By Allyson 42 Comments This post may contain affiliate links. Read my disclosure policy. Back in January one of my friends, Stacey, announced she was pregnant with number 2! I was super excited for her….especially when she started talking nursery décor as I like to live vicariously through my friends who are decorating their nurseries. It’s so fun to brainstorm ideas with them, and Stacey had a theme in mind that was going to feature one of my favorite decorating colors, grey! She ended up choosing navy and green for her accents, and the combo was perfect. 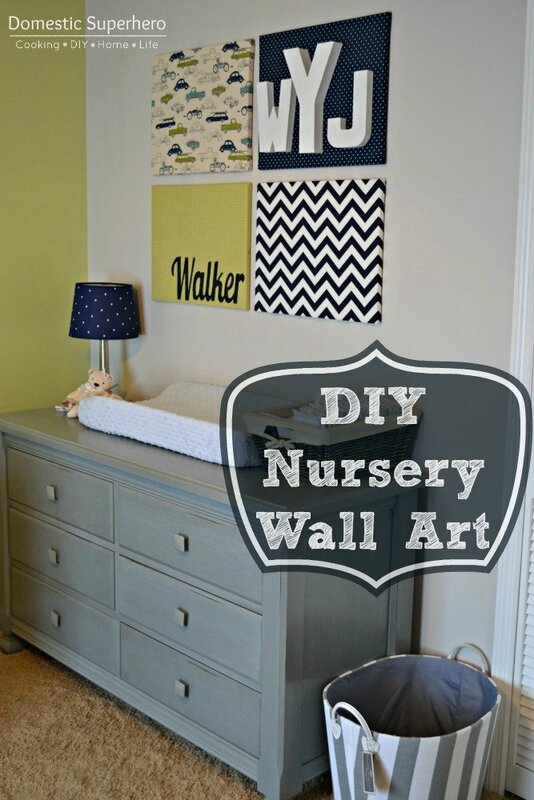 While browsing pinterest one day I came across the cutest nursery, which had the cutest wall art! I was in love, but had no baby to share it with! 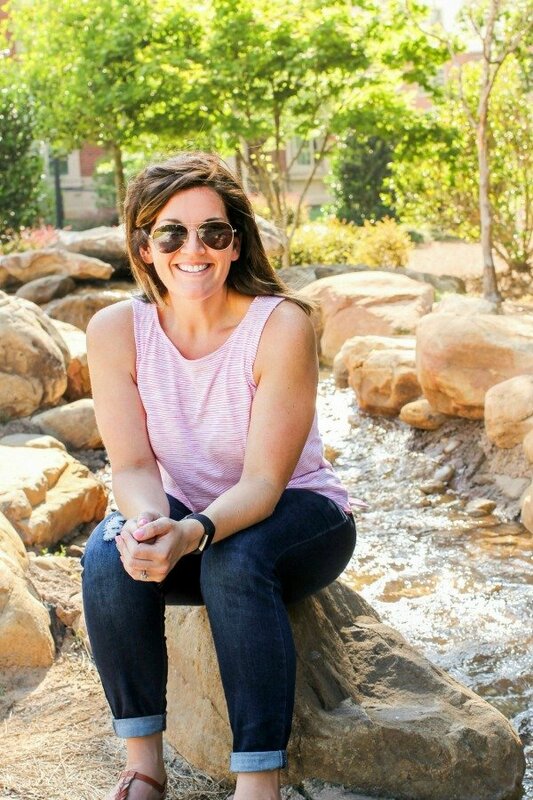 I wasn’t shocked to find out that this blogger made them herself, and I wanted to share the idea with my friend, because I thought she would love it too! She did love it, and I encouraged to make her something like that for her nursery….but as time went on, I told her I would just make it for her! 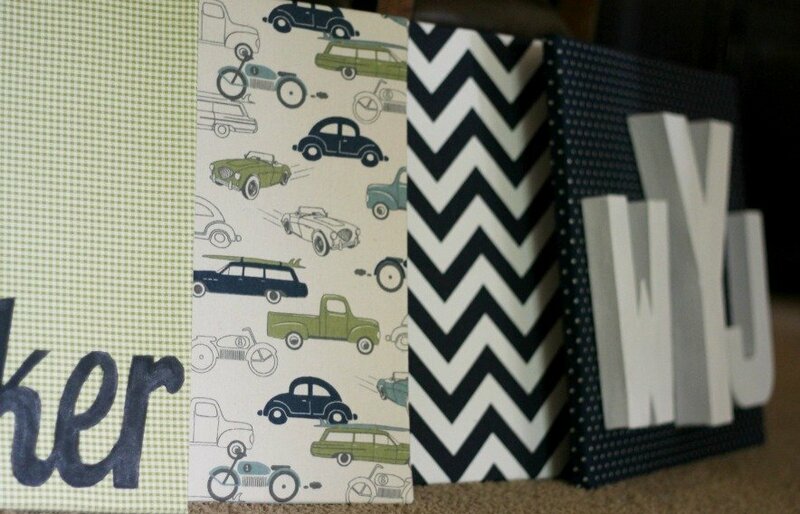 I ended up finding the CUTEST fabric at Hobby Lobby and then she decided to incorporate it into her color scheme, and do a retro car theme in the nursery! Love! I didn’t take photos while making these canvases, but it’s not very difficult to explain or make. I used 4 16 x 20 canvases . I found the fabric at Hobby Lobby, and covered the canvas, stapling it to secure it. As for the monogram, I found these cardboard letters at JoAnn’s, and then painted them. Originally I planned to paint them green, but then Stacey and I agreed that we liked them better in white. I used some Liquid Nails Glue to secure them. ‘Walker’ is painted on the green fabric, and this is the only one I had a lot of trouble with. We really wanted to replicate the font that was used in the inspiration above, but I didn’t have a Silhouette (fancy cutting machine), which would cut out the name for me. After trying several things, and failing, I finally reached out to one of my blogging friends, and she made a printable PDF for me!! Next, I had that printed onto cardstock. Then I used an exacto knife to cutout the name, and make a stencil. Then I painted it using craft paint. I love the vintage car fabric. Last time I was at Hobby Lobby they still had it, too! Do you love them as much as I do? It would be so easy to change up for whatever nursery theme! Ok, now lets see what Stacey did with the rest of her nursery….. I love her grey crib and green/white/navy bedding! Opposite of the crib she has a nice cozy rocking chair, and a bright window! 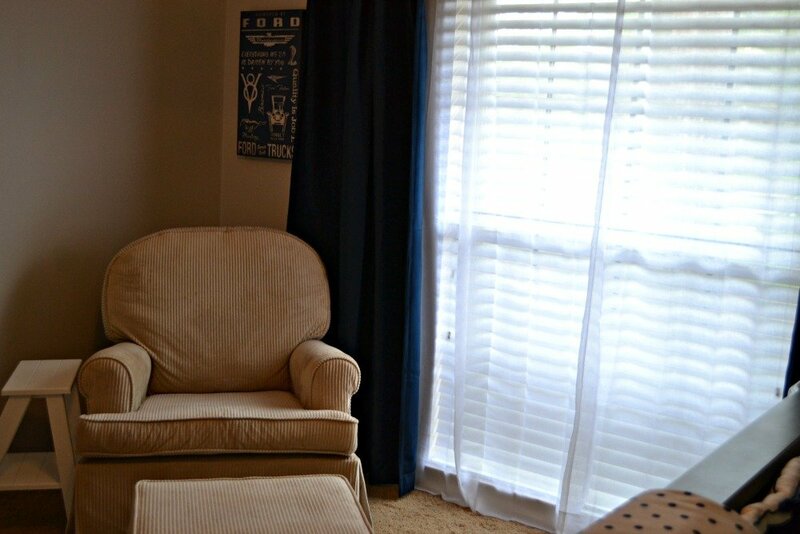 She chose navy window treatments, and can you see that vintage car sign peeking out from the behind the chair?! Love it! I absolutely love her grey matching dresser! It has slight distressing and goes perfectly in the nursery. She hung the canvases above the dresser and they look great! 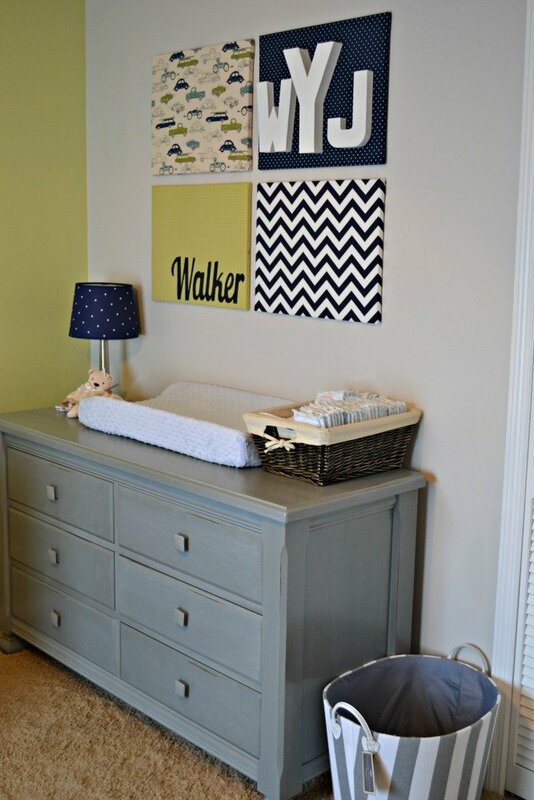 The dresser is doing double duty as a changing table, which is convenient and maximizes space. We did the same thing in our nursery a few years ago! Anyway, I am just in love with this whole nursery! Wondering who is occupying this lovely space? My friend, Stacey had her beautiful baby boy, Walker on July 8th! He was 8lb 6oz and 22 inches long. Walker is lucky to have an awesome big brother, Braxton, who is 2.5! Congratulations to their lovely family! Hi Allyson, this wall art you made is amazing! You did a great job! I hope all is well with you and see you Thursday! Very cute! Nursery decor is so much fun. Its a gorgeous space! I too love that retro car fabric!!! These turned out so cute! Great job! I’m totally hacking this for our bedroom!! I love this nursery! And I love love love the gray, green and navy blue color palette. We just found out last Friday that we are having a boy and we are in nursery decor mode. Exciting times! Congrats!! Boy are the best!! When are you due? How exciting! Thank you! I am due in January so I still have a bit to go. Knowing that we are having a boy is definitely helping us get a move on with the nursery and picking out a name though. Hubs is SO against gray for some reason!! I really like the navy blue and green palette though so I think I might go with that… and maybe throw some orange in the mix. So many options and too many cute themes to choose from!! I love grey! Maybe if you show him grey with other colors?! I have seen a ton of really cute grey/yellow nurseries! Funny you should mention those colors, I am redecorating my son’s room into a big boy room right now…using navy, green, orange, and white! I loooove it! I have showed him pictures of complete gray nurseries and he just doesn’t like it. Sigh, I will just give in on this one! =] He did excitedly call me at work this morning and tell me he think he has the theme he wants to go with. I’ll have to see what this is all about… haha! So cute! 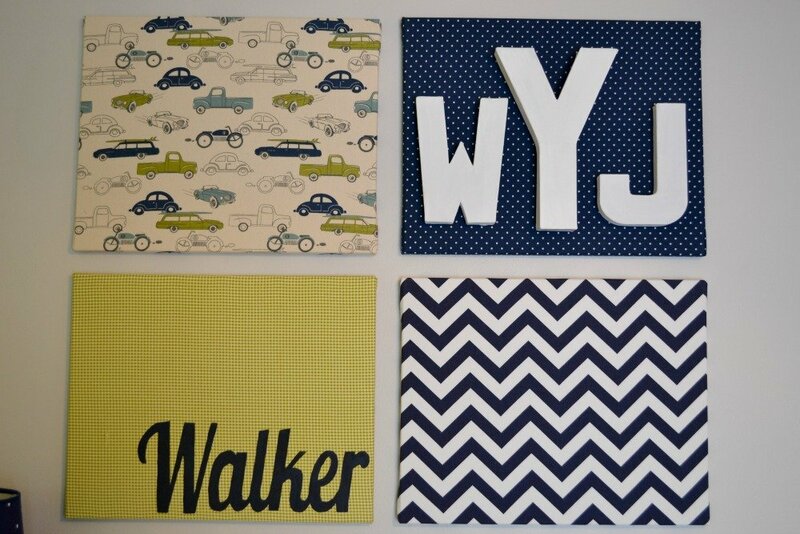 Was in the middle of brainstorming ideas for adding something monogram-y to my son’s room and this is perfect!! I just made a similar monogram piece for a friends nursery. Parallel lives, haha. Great job- love the car pattern! You did?! Did you post it? I want to see! I love the colors and I love how this all turned out! Nice Job! Thank you! I really love them too! I love those canvases!!!! They are adorable. And I’m sure that the same concept could be used for grown-up decor. Those colors your friend chose for the nursery are perfect too. I am a huge fan of gray as well. Thank you! You are right, the concept works well anywhere! I have a tutorial on here on how to make your own custom canvases as well! It’s so easy and can be matched to any decor! Thanks for coming by, Karen! What a lovely gift (and I’m so in love with the retro car fabric). Thanks for sharing at Inspire Us Thursday at Organized 31. So Cool…yours looks better than your inspiration (which was also adorable). I LOVE, LOVE, LOVE the gray furniture. Did she buy it or did you paint it…if you painted, can you point me to your tutorial because I know you blogged that awesomeness!!! haha, Niki! I didn’t paint the dresser, but I think if you got your hands on some chalk paint, it wouldn’t be too hard! I did makeover a dresser a while back, and paint it grey, but it’s not distressed and aged like the one in the nursery. You can check it out here if you want! Thanks for the sweet comments about the wall art, too! This happened while I was on vacation, so I’m just seeing it now, and I LOVE how it turned out! Lucky Walker! Great, great job, friend!!! 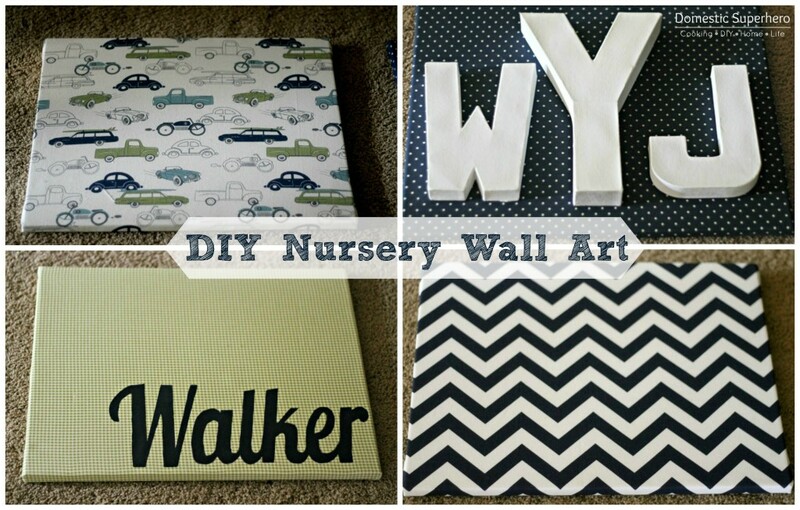 I am featuring your diy nursery wall art today on my blog. Thanks for linking it up. I hope to see you tomorrow for another link party. Thanks so much Lauren!! I am going to grab your button and share on my Facebook page! Hi! I have to ask where you found that grey furniture?! It’s fabulous! I love these colors! I am pregnant with my first… A baby boy… and I really want to paint the walls the same color as this nursery. Any way you can tell me the brand and color of both the green and tan paint on the walls? 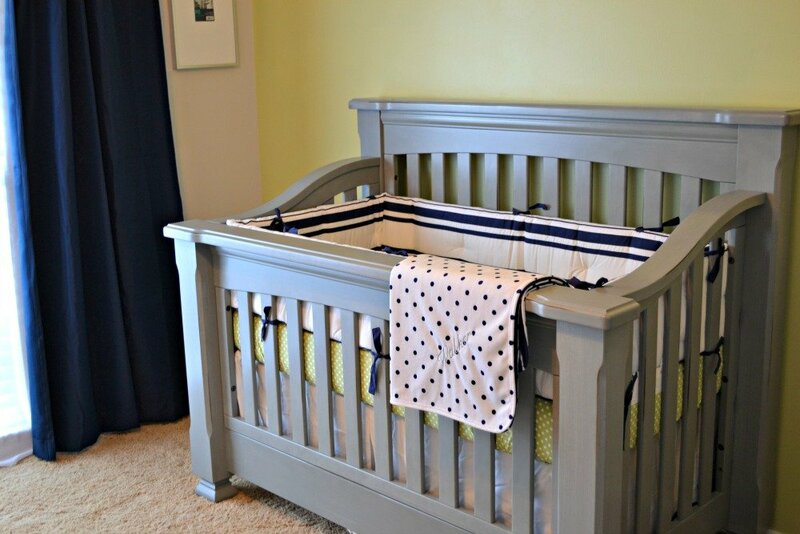 This is a really random question, but I have a crib that is very similar and have the same crib bumper. We are havin trouble attaching ours at the top and was wondering how you were able to attach that one?! 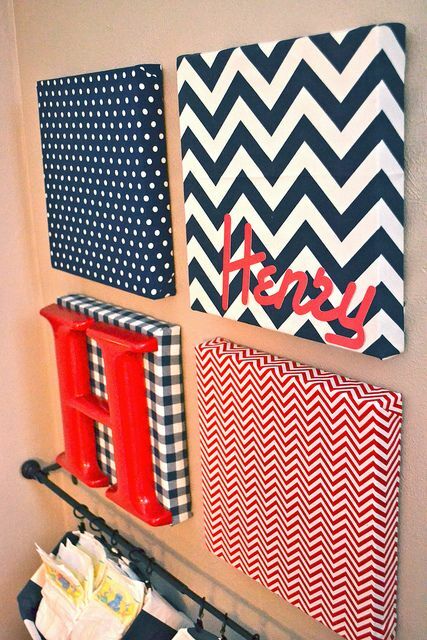 Oh and I love the canvases and plan on replicating! Thanks for sharing! Hey Betsy, I asked my friend and this is what she said, “My bumper was pretty stiff and just kinda stayed nice and upright …if it hadn’t I thought about doing Velcro on back of the bumper and inside of the crib or double sided tape. Now thAt I’ve dropped the crib lower it all ties up.” Hope that helps! Looks so cute! I am sharing this on Pinterest. Would you happen to know what the paint colors are? I love the grey, it’s the perfect shade! I’m currently in the process of redoing my sons room and I fell in love with the retro car theme and he’s really into it too! Win-win!